The smash hit ‘High School Musical’ will be delighting Lisburn audiences later this month as Lisnagarvey Youth Society bring a glittering production of the Disney classic to the Island Hall stage. Based on the 2006 Disney movie, the story follows two high school juniors – Troy Bolton (James Marsden), captain of the basketball team, and Gabriella Montez (Anna Farrelly), a shy transfer student who excels in mathematics and science – as they try out for the lead parts in their high school musical. Meanwhile high school diva Sharpay Evans (Naomi Lloyd) - assisted by her dim-witted brother Ryan (Rhys Waterworth) - will do anything to sabotage the friendship between Troy and Gabriella and also get a lead in the musical. The principal line-up is supported by an enthusiastic cast of 60, who have enjoyed a summer of dancing, singing and learning lines. The show is directed by Andrew Devonshire who has previously written and directed plays for the Bart Players and starred in several of Lisnagarvey Operatic Society’s pantomimes as the irrepressible dame. This is Andrew’s first production as director for the society. 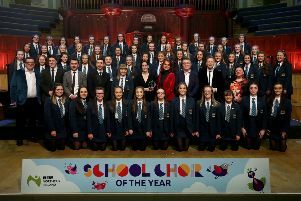 “I am absolutely delighted to have been given the opportunity to direct such a talented group of young people,” he said. Be sure to get your tickets booked and join Troy and Gabriella as they take to the stage. High School Musical takes place in the Island Hall, Lisburn, from Thursday 27 to Saturday 29 August and tickets are availiavkle from the Box Office o9n 9259 9254.